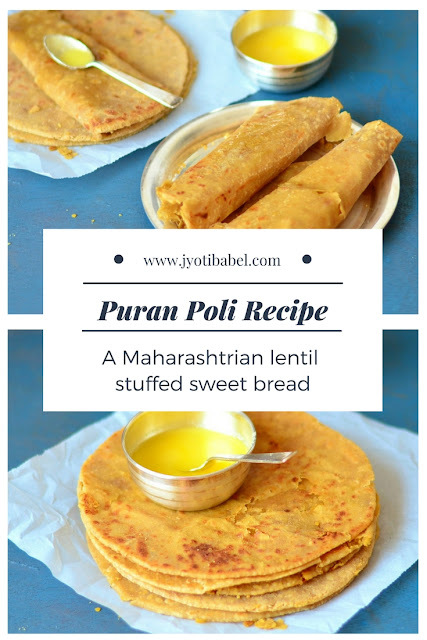 Puran Poli is a lentil stuffed sweet flatbread from the state of Maharashtra. Chana dal, jaggery, flour, cardamom and ghee are the vital ingredients in this recipe. A similar puran poli is also made in Gujarat and some southern Indian states, but there is a difference in the lentil used for the stuffing. Like in Gujarat, toor dal is used while in Maharashtrain puran poli chana dal is used. Making puran poli from scratch is a tedious job. However, on most festive occasions like Holi, Ganesh Chaturthi, Diwali, etc., in Maharashtra, it is a must-prepare dish. 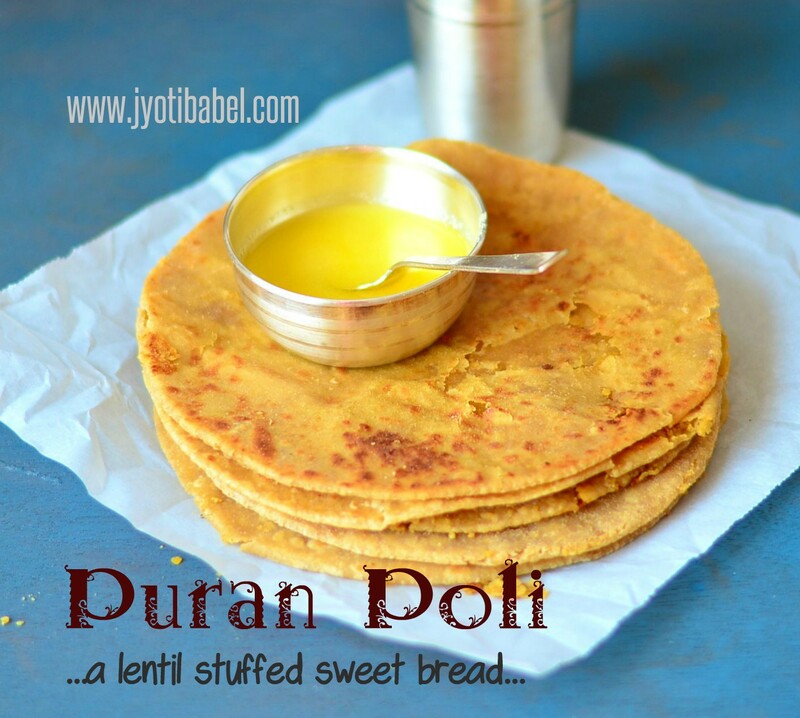 In Marathi, 'puran' means the sweet filling and 'poli' means roti or the flatbread. 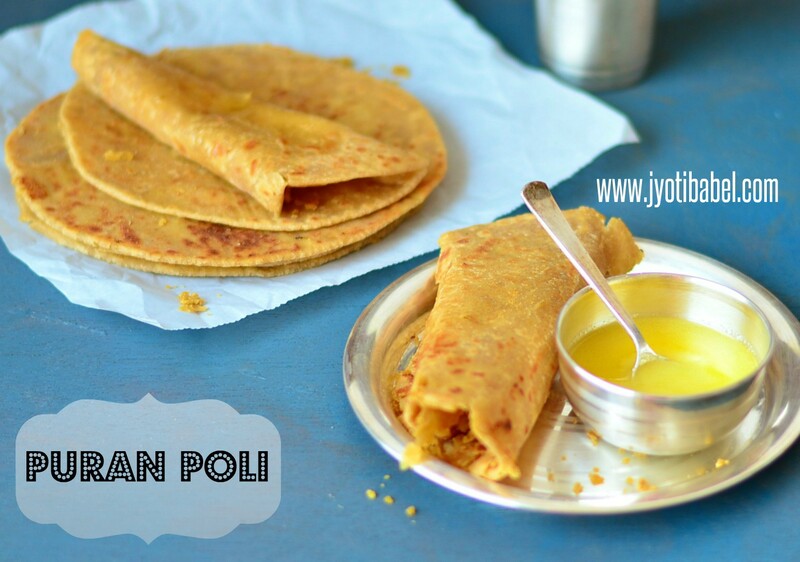 Puran poli tastes great in itself; you can also serve it with ghee and milk. I was very sceptic about making it on my own, but some tips from my house help who is native to Maharashtra and encouragement from my friends, I made puran poli from scratch. And I am so glad that everyone loved it. I adapted my recipe for puran poli from here. I made a lot of changes to this recipe without interfering with its authentic taste. Let's check out how I made this puran poli. 1. Wash and rinse the chana dal nicely first in water. Soak it in fresh water for about an hour. 2. To cook the chana dal, add the chana dal to a pressure cooker after draining the water it was soaked in. Add 2 cups of fresh water and cook it till 2 whistles on high flame. Lower the flame to low and let it cook for another 10 minutes. Switch off the flame and let the pressure subside on its own. 3. Put the cooked dal over a strainer and let all the water drain away. You can use this stock in preparing gravies. Churn the strained Dal in a mixer grinder. 4. Heat ghee in a kadhai, add the churned chana dal, jaggery powder and stir nicely such that the mixture is uniform. Cook it over low heat for 15 to 20 minutes and keep stirring. The mixture will get dark brown in colour and will look like halwa. Add the cardamom powder and soaked saffron and stir again. 5. To make sure that the filling is ready, insert a spoon straight into the filling and if it stands in that position, the filling is properly cooked and is of the right consistency. Switch off the flame and let the mixture cool completely. While the mixture is cooling, we can make the dough for the poli. 6. For preparing the poli dough, take whole wheat flour/atta, and salt in a bowl and mix well. Add ghee and using water knead into a soft and smooth dough. Cover the dough and keep aside the dough for 20 minutes. 1. Divide the dough into large lemon sized balls. Keep them covered. Similarly, divide the filling into an equal number of large sized lemon balls. 2. Roll a dough ball into 2-inch diameter circle using some dry flour on the rolling board. Place one ball of the puran mixture in the circle of the dough circle. Bring the edges together at the centre and seal it by pinching it together. 3. Sprinkle some flour on the rolling board and roll the filled dough ball into a medium sized circle. Roll it gently, else the dal mixture will come out at places. 4. Once you roll a few of these, you will get an idea of how much pressure to apply. Place the rolled poli on a hot tawa. When one side is slightly cooked, turn over and apply some ghee. Press it with a spatula and cook it over medium-low heat. Turn it over again and apply ghee on the other side as well. Both sides will show some brown spots and the poli will puff up. It will take about 3-4 minutes for each poli to get cooked. 5. Continue the same with each of the dough ball and roll, cook and then stack them one over the other in a casserole. 6. Puran poli can be served warm or at room temperature with milk, ghee or yoghurt. 1. It is likely that your first few polis will break. Be gentle in rolling and use some extra flour while rolling. With practice you will be able to roll them better. 2. If you can get someone to help you in the kitchen with the rolling or cooking part, things can be a lot more manageable. Sure it was worth going all the trouble . They have turned out great , soft and melt in the mouth kinds . Puran poli is just calling me to grab some and have rite now. How delicious those polis looks. Delicious n droolworthy. The puren polis have turned out so good...the clicks are so pretty. Even the polis we make in south has chana dal, sometimes we make with split moong dal as well..the only difference is that we pat it done, while the maharastrain version has it rolled out like a stuffed paratha..love this so much, that no matter which version, its a sinful treat! I once made poli and I know all the hard work is worth trying. Yours look irresistibly delicious. Love puran poli in all its variety. My mom makes it with toor dal stuffing. I have tried chana dal and moong dal as well. Beautiful pictures.. These puran polis tasted so great. I could not resist myself to ask for more and literally went home to have some more. A great recipe. Perfectly made puran poli Jyoti. They looks so soft and flaky. Great to make for festivals. your Puran poli is looking quite soft and perfectly made. That bowl of ghee on the top is making it all the more attractive. Love puran poli... perfect snack n complete meal.